Hope that everyone had a fabulous Christmas! I know you never thought you would eat again but here you are. Hungry again. How is that possible? Doesn't matter, it's inevitable. So without completely losing the festive feeling of the holidays I wanted to make something that would hang on to Christmas one more day...a pizza shaped as Santa's face! Just kidding. 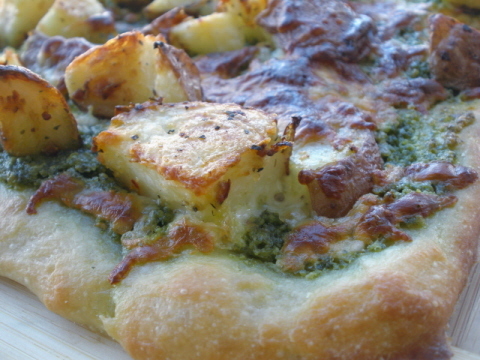 However, the green pesto and red skin potatoes do look lovely and Christmas-y. I could have at least made it into a wreath shape! Shoot I messed up. My redemption for not making it into a wreath came when we tasted it. Thanks goodness! Preheat oven to 400°. In a stock pot, or large sauce pan, bring ½ tsp. salt and water to a boil over high heat. Once boiling, add the potatoes and cook until fork tender, about 10 minutes. While potatoes are boiling mix the following in a small mixing bowl: EVOO, salt-free seasoning, red pepper flakes, ¼ tsp. salt. Once the potatoes are removed from the stove and strained, add them to the seasoning mix. Toss to coat. Place coated potatoes in a roasting pan and roast at 400° for about 30 minutes or until golden brown, stirring once during the cooking process. While the potatoes are roasting, shape your dough into the desired shape, adding as little flour as possible. Poke several small holes in the crust with a fork to prevent bubbling. Transfer pizza dough to whatever, pan, stone, etc you will be using for cooking. Once you have removed the potatoes from the oven, increase heat to 500°. Brush crust with a bit of EVOO, and cook without toppings for about 5 minutes. Add pesto and spread evenly. Then add roasted potatoes, and mozzarella. Cook for 10 or so minutes more, or until golden brown.